It doesn't seem like Christmas around here to me. That's a little sad, isn't it? Well, it doesn't seem like it to me because I have not been in a store to shop. I've been shopping online and that doesn't really put me in the Christmas spirit. My husband picked up gifts while Jamie and I were in the dentist office for appointments so I missed out on all the fun. Hopefully, weathering permitting, I will get to do some last minute shopping on Tuesday morning in Dickinson, North Dakota. Yeah, I'm not too thrilled about last minute shoppers but I'm excited about going. I wanted to show you what I've been working on that is keeping me from blogging. My sister asked me if I would knit a sweater for one of her friends' new baby girl. I was in a mess trying to work on this project and the project in the next picture. I wanted to use another pattern for the sweater but after frogging the project three times, I decided to go with a pattern I have used in the past. This pattern usually takes a couple of days to knit up; simple and easy. Sadly, I can't find the pattern on the internet to share. But, if you can find a discontinued ball of Plymouth Cotton Kisses yarn, it's on there. Those little MARY JANES those were fun! From start to finish they only take a couple of hours. 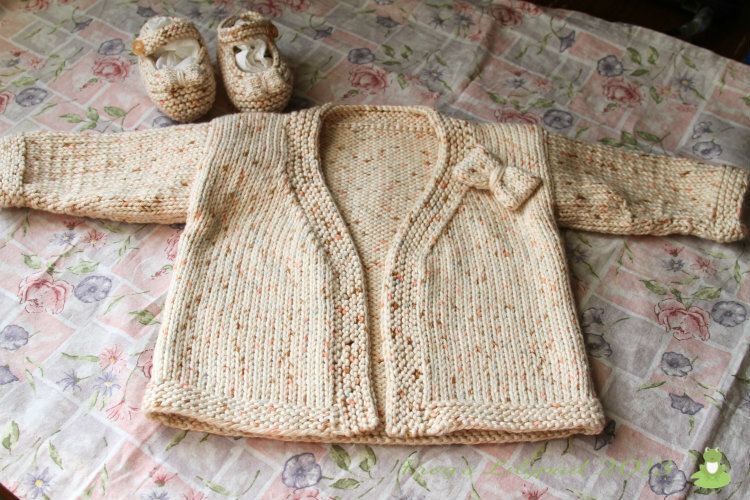 I took a picture of the sweater before I put the buttons on because I wanted knitted buttons but I made the hole too small, so I used buttons to match the ones on the shoes. I decided back in the summer, I was determined to have the afghan I started in 2007 finished for Christmas. 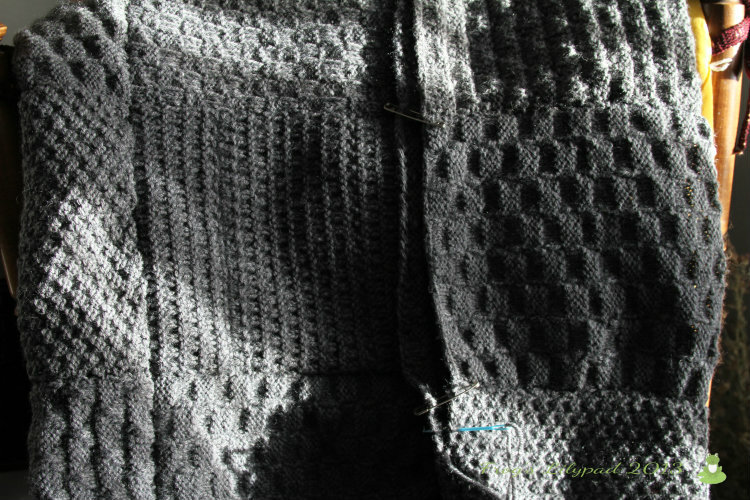 I spent a week blocking all the blocks I made to find I still needed about 30 blocks to knit. Yeah, this is bigger than a normal afghan. But I have a bigger than "normal" size husband who is tall. Since I finally completed the baby sweater, I have been able to focus on this. It probably won't be 100% complete by Christmas, but it will be finished enough for my husband to see and use. This is the PATTERN I'm using, all I did was triple the amount of blocks needed. It is quite simple and easy to work with. Jamie and I are on the backside of this nine weeks of school. Friday will be the last day until January 6th. I can't believe we are half way through the year! The school years just keep flying by and there is no way to slow them down. What am I going to do?